Increasing [CO2] will enhance photosynthesis and improve water-use efficiency, thus increasing yield in most crops. Relative benefits from increased [CO2] can often be maintained with modest water and N deficiency, but yield benefits on an absolute basis are reduced when water or N limit growth. The impact of increasing temperatures is more difficult to predict. Seed germination will probably be improved for most vegetables, as will vegetative growth in regions where mean daily temperatures during the growing season remain under 25°C, assuming adequate water is available. Reproductive growth is extremely vulnerable to periods of heat stress in many important vegetable fruiting crops, such as tomato, pepper, bean and sweet-corn, and yield reductions will probably occur unless production is shifted to cooler portions of the year or to cooler production regions. This vulnerability results from the shortened duration of grain, storage tissue, or fruit-filling and from failure of various reproductive events, especially the production and release of viable pollen. Processing crops, which are sometimes direct-seeded and are more frequently grown in cool-summer areas, are more likely than fresh-market crops to benefit from higher temperatures. 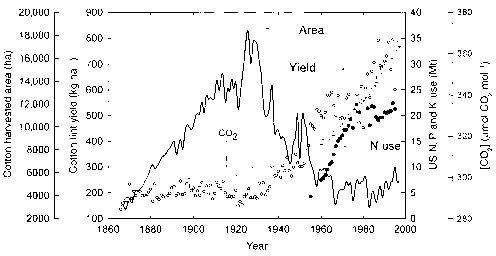 In general, crops with a high harvest index, high sink demand, indeterminate growth and long growth seasons are considered most likely to respond positively to the combination of higher [CO2] and temperature. Relatively few crops have been studied, however and cultivars within a crop often differ in their responses, thus making generalizations difficult. In many crops, high temperatures may decrease quality parameters, such as size, soluble solids and tenderness. For fresh-market vegetable producers, even minor quality flaws can make their crops completely unsaleable in some markets. Reduced or more irregular precipitation will also decrease vegetable yields and quality, although soluble solids and specific weight may increase in some crops. Leafy greens and most cole crops are generally considered to be cool-season crops, so heat stress during the growing season would be detrimental to these species. High-temperature effects on lettuce and spinach and low-temperature effects on cole crops include induction of flowering and elongation of the seedstalk. Perennial crops also require an overwinter cool period. Thus, planting dates, production areas and cultivars may need to be adjusted if temperatures change.